Hubby and I were watching "Old Yeller" (yes, I blubbered at the end ) and watching Maw with her apron reminded me of my grandmother, who put one on every AM, and didn't take it off until supper dishes were done and put away. The woman must have owned 20, and could whip one out on a sewing machine in no time flat. But Mom never, ever wore one. Flash-forward to the '60s and aprons became an art unto themselves — the housewife's fashion statement. "Aprons evolved. Busia aprons were a necessity. Those Laura wore in the late '60s with her capri pants and little flats, it was a fashion statement," Scheel said, of Laura Petrie, the character played by Mary Tyler Moore. I own precisely one apron. It is an el cheapo light cotton ugly thing that almost never sees the light of day. Upon reflecting on my dirty laundry, and considering the clothing I've ruined with cooking stains, I think it's time to go apron shopping. What do you look for in a good apron? I usually wear one when I cook -- I'm messy and I can't afford to be replacing my clothes all the time. I have a homemade one from my daughter and maybe three cheapy solid colored ones from a restaurant supply store. All do the job. I used to wish I had some pretty floral ones like Nathalie Dupree wore on her cooking show in the eighties or nineties. Korean wives always have an apron on whenever they are at home doing the washing, fixing diner and what-nots. Bowing to peer pressure, I brought a pretty dark blue one with checkered trim a couple of years ago and use it when I REMEMBER TO. LOL It still almost looks brand new. Almost always when I forget, my clothes get spattered with grease, sauce or get wet when I wash dishes. Then I remember about my pretty blue apron. Both of my Grandmothers wore aprons while they were in the kitchen. My Mother only had one on if she was dressed up, like for Thanksgiving. I've never worn one in my life, but I might. I live in Cape Town so its usually rather hot and when combined with the heat from the stove a full size apron is just to warm. Since I don't want to wash my trousers every day i started using waiters apron, I have about ten plain white ones that i use. I wear the white aprons you get for commercial use from Sam's Club-only when I'm doing a marathon of cooking. I also have one my hubby's grandmother made me with lots of pockets, the only time I use that one is for yard sales. I'd like to think I look slimmer when it is folded and tied low, down on my hips not up around my waist. Kinda like Giada. No but seriously, I only wear aprons in a commercial setting if I have to. Depending on the type of work I'm doing. If I'm slogging though setting up cakes and getting gooey crumbs & juicy fruit everywhere yeah an apron might be nice. But for decorating & stuff, nah. I'll make good on my favorite apron ^^^^ Rahhhrr!!! Most of the time, however, I now use an apron made by Vaho, which is a recycling arts collective in Barcelona that uses things like PVC public displays to fashion bags and other things. People really cook -- like fry or sauté? make tomato sauce? stir roux? -- without aprons? Do you change into chefwear first? I definitely wear an apron when I'm cooking - as long as I remember to put it on! Unfortunately, I forget far too often, so I end up with a lot of grease-spattered shirts. I also have one particular pair of jeans that has suffered - and recovered from - many different kitchen stains, to the point that I'm now convinced they're unstainable. I can't imagine it'd be worth investing in those houndstooth pants you see so many professionals wearing, but I might change my mind the next time I ruin a pair of jeans with sputtering tomato sauce. Lidia's Nice Silk Blouse: Kitchen Fashion. ETA: My apron features Australian animals, sent as part of a Blog By Mail exchange. Bib, of course. While I could understand the whole French-maid thing on a certain level, I just don't get the 1960's TV Mom trend of tying a half apron around one's waist--or the practice on cooking shows that prompted the earlier thread. Professional chefs wear jackets for a very good reason. I only seem to wear an apron during a holiday cooking, like Christmas or Thanksgiving. Usually because by the end of cooking, I'm dressed up and ready for company. I have one apron which I love. Bought it at a craft store years ago. 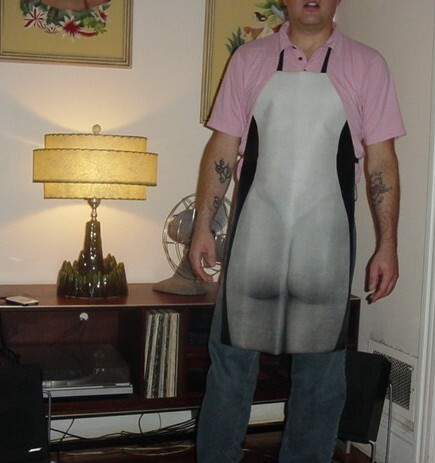 It's definately a girly apron. With ruffles and all. But I love it. Hello, my name is Maggie and I am addicted to aprons. Let me restate that: it may be a fetish rather than an addiction. Yes, I wear them because I am a messy cook and I long ago realized that grease and tomato sauce are the quickest way to wardrobe ruin. I see them too as art, artifact and the best possible reason to own a sewing machine, yards of rickrack, piles of patterns and enough one yard remnants to wrap the Sears Tower in a Christo-like installation. I'm thinking about copying an apron my mother bought a couple of years ago at a Christmas bazaar at a local Ukrainian parish: a Ball Apron. It's a tiny flirty black organza and lace number, aflutter with little red bows. I can guarantee he'd like this one. That's what I mean. I Love making them but I'll be da... if I wear one. I do, only because I have the best apron in the world! I like my apron with lots of pockets for my kitchen timer, thermometer, etc. Mine came from IKEA and was originally intended for use in the workshop. The hammer loop can be used for a spatula, and there's a loop on the other side for a hand towel. Unfortunately the heavier fabric (meant to withstand wood tools and such) can be kind of hot to wear in the kitchen, but the utility makes it worth it. I wear the white industrial ones at work, and sure enough, I can manage to get chocolate, cake batter, you name it - everywhere the apron doesn't cover. I can't win! I sometimes do, like if I'm going to be working with chocolate, which somehow I always manage to get everywhere. My aprons are all pretty utilitarian, though I do have a pretty waist apron a friend gave me one year for my bday. I keep meaning to pull it out when we have company and I'm finishing something up on the stove, but I always forget! One thing I do like about wearing an apron is that it gives me a place for a side towel, something I'm never without at work, but never seem to manage to have handy when cooking at home. I usually wear one only when baking (flour everywhere) or frying (spattering). As a Capetonian, you'll appreciate what it says: "May the Wors be with you!" After ruining too many shirts with oil stains, I now have three aprons. Two are the usual tie at the waist and neck variety which are fine for prep work. A long-sleeved denim shirt comes out for saute work. One too many oil burn on my arms in addition to more ruined shirts! I too have ruined far to many clothes while cooking. I went back to using aprons; regular ones and also the "granny/50's housewife" kind. I like the idea of an old denim shirt for frying. I hate grease pops. OUCH! I wear one when I remember to put one on...i.e., when I'm not in a hurry...and often the rolled up sleeves get spattered anyway...gonna use the spare over-shirt trick suggested from now on! The denim shirt I use has a stand-up collar which give some added protection. It gets a bit warm so I usually just wear a light camisole underneath and then switch to a nicer shirt when the dirty work is done. This shirt was in the back of the closet for a few years because it was too big and heavy to wear. It turned out to have a good purpose afterall!